Hi everyone! Have you checked out those adorable halloween stamps by Lawn Fawn? Today, I'm sharing with you a card using one of the sets called Monster Mash. I've colouring all the images, stars the hill with various copic markers. I've adding some stickers to the red horns and the base of the purple monster for added interest. 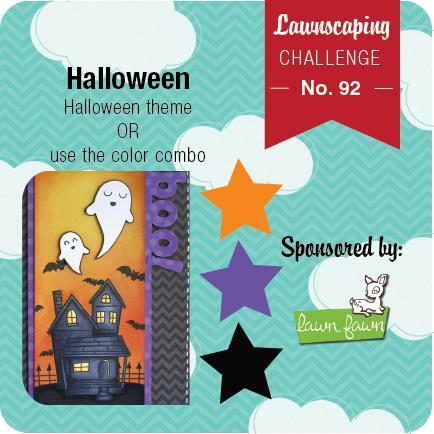 Head over to Lawnscaping Challenge to enter your own card with a Halloween theme or just using the fun colour combo to win a prize sponsored by Lawn Fawn! Aw!! This is wonderful! Love those little monsters!! And I can't believe you colored all of that in with copics!!! Bravo!! Awww so cute :) fab design!